To produce this most attractive colour variety it is necessary to mate two cats that both carry the genes for blue and chocolate. As many of the early seal point lines produced both blue and chocolate offspring, lilac point Siamese must have appeared long before they were officially recognized in England in 1960. In the USA the lilac point variety was recognized 1954-55, under the description “frost point”. The English breeder Mrs Hargreaves in the 1950’s produced lilac pointed Siamese artificially by outcrossing Siamese with Russian Blue. Kittens from a mating between a Russian Blue and a chocolate point Siamese will carry the genes for both blue and chocolate. They will thus be able to produce lilac pointed or lilac kittens when mated together. Mrs Hargreaves mated a seal point Siamese queen, Laurentide Ludo, with the Russian Blue male CH Silvershoen Blue Peter. The result included two solid black females, Laurentide Ephone Ebony and Laurentide Ephone Jet. These were mated with seal point males and produced two seal points, Laurentide Ephtoo Sapin and Laurentide Ephtoo Jade that were mated to each other. This mating between Ephtoo Sapin and Ephtoo Jade produce Laurentide Ephree Amethyst who was registered as a blue point Siamese with experimental pedigree. She was in due time mated to the blue pointed Siamese Chatwyn Tamarack, whose mother, Mistery Maid, could trace her ancestry back to the Russian Blue-cross. This combination produced the two males Laurentide Quicksilver and Laurentide Mercury. These were first registered as blue- and chocolate points but at least Laurentide Mercury eventually became recognized as a lilac point by the GCCF and was eventually in 1962 registered as lilac point, two years after GCCF’s official recognition of the variety. Meanwhile, on the side of the breeding program with the Russian Blue-crosses, the lilac point male Belhaven Apple Blossom was born in 1958. He was out of the chocolate point female Carson Truffle, who carried the gene for blue, and the seal point male Sloppy Joe who carried both blue and chocolate. What made Apple Blossom unique was that his pedigree was pure Siamese as far as it was possible to trace, and he was allowed to be registered in the ordinary register. He was shown by his breeder mrs Phyllis Lauder. Allready in 1955 Mrs Hargreaves had shown her lilac points at the Siamese Cat Club show in London. Another breeder who successfully started breeding lilac points in the late 1950’s was Mrs Alison Ashford (today still a well-known judge). She exported the lilac point male Annelida Lilac Zephire to the USA where he became the father of a very successful lilac point female, Sicat’s Sheer-Mist of Gables. Other early winning lilac points that are mentioned from the early 1960’s were IC Sicat’s White Tulip, exported from the USA to the Netherlands, and her daughter White Lily van Siana, Australian-bred Ch Nokomis Lilac Domino in New Zealand, Gr Ch Chantilly Lace bred by Mrs Grace Staden in Canada, Simiane de Gravenoire in France, etc. These cats are all said to have combined a for that time very good type with the desired pale pinkish point colour. Soon lilac points with too blueish colour that were difficult to separate from blue points began to appear. Many breeders were wrongly seduced to believe that as the lilac points, as well as chocolate points, maintain a pale body colour so long, matings between seals and lilac points would improve the body colour of the seal points as well. 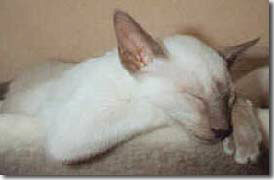 In the late 1950’s and in the beginning of the 1960’s lilac point Siamese also began to gain ground in Scandinavia. Doneraile Lilac Monseigneur, a lilac point male whose sire was Laurentide Mercury and whose grand-sire was Laurentide Quicksilver, was imported together with the blue points Browndrey’s Scamp and Browndrey’s Tana, descending directly from Laurentide-cats too and so could be traced back to the original Russian Blue-cross with Silvershoen Blue Peter. These three imports were frequently used on all point colours in Scandinavian Siamese breeding. Monseigneur’s offspring included a lilac point daughter, IC Rangoon Lilac Buddleia, that was imported to Sweden from Denmark and became a prominent breeding queen for breeder Mrs Margit Lans (prefix av Amur). Buddleia produced IC Lilac Mino av Amur (sire: Frosted Kator av Asplid). Mino became the foundation queen of Mrs Sussie Broberg’s Brobackens Siamese and produced a number of successful offspring. A mating between Mino and Kashmir Camillo resulted in IC Brobackens Chocolate Simon who was successful at shows in the early 1970’s. 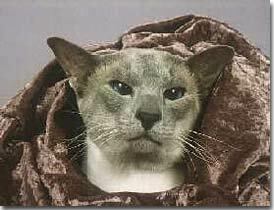 Simon was mated back to his mother and among their offspring was IC Brobackens Lilac Saba who won several BIS Siamese. Several lilac points of top quality were bred by Mrs Eiwor Andersson in the early 1970’s, including IP San-T-Ree Frosty (Riro Sookmo x San-T-Ree Chocolate Kiefer), who was overall 3rd on the SVERAK Top cat of the Year list in 1973. The female IC San-T-Ree Chocolate Dee-Dee, out of the US imported female Purr-Du Caress, produced IC San-T-Ree Lilac Pearl who on her part produced IC San-T-Ree Novas Fay, second Top Cat of the Year in Sweden 1975. Novas Fay was owned by Miss Dagny Lindberg (now Dickens) and became the progenitor of several lilac points of good quality under the prefix Novarita in the 1970’s. Lilac Pearl also produced a litter of entirely lilac points with the lilac point male Granlids Mustafa. Other lilac points of good quality in the 1970’s were Pilevallens Baby Doll, sired by the lilac point CH San-T-Ree Lilac Topper, together with several successful lilac points from the Näsets prefix (breeders Mr & Mrs Ruus). In the 1980’s CH Maytime Grandee, chocolate point, was a very important stud in Sweden and he also produced some lilac points. Grandee was a UK import and his sire was the very famous CH Maytime Landucci, lilac point, who still appears in the pedigrees of many Siamese both in Britain and in other countries. Grandee was eventually neutered but lived in full vigour until just one year ago. Lilac points in the 1980’s were, apart from Näsets, also Coccinels (Mrs Birgitta Johansson) and Stjärnregnets (Mrs Monica Holst). GIC Stjärnregnets Leo de Lyx was highly successful and became first lilac pointed Siamese to achieve a Grand title in Sweden. The lilac point female IC Daggryningens Blenda, from Maytime Grandee-lines, was one of the foundation queens behind the Coccinel-cats. Mated to the lilac tabby point IC Nools Pink Patrik, also from Maytime-lines, she produced several winning lilac points including EC Coccinels Turbo, who was exported to Norway and besides being a successful stud also became the first Scandinavian lilac point to take a European title in 1993. Two lilac point imports from Australia, Qwashon Lilac Atanamir and Qwashon Lilac Arda, were bought by Mrs Johansson and mated together produced IC Coccinels Unicef, another lilac point male that had a successful stud and show career in Norway. In the late 1980’s a lilac pointed male, Livrabar Sooji, was imported from England by Mrs Holst and Miss Eva Andersson (Ma-Thangas). None of his offspring seems to still be bred from today. Sooji’s sire was Gr Ch Daunus Pascali, more of whom later. Some other prefixes that produced lilac points to some extent in the 1980’s were Ram-Tam-Ta’s, Hunt’s, Simsalabim and Jawelyn. In Norway some very fine lilac points have been bred during the late 1980’s and the 1990’s, mainly from the prefixes Liberho’s (Mrs Liv Holst), (N)Fiori Avanti’s (Mrs Laila Myrvold) and (N)Benill’s (Mrs Bente Kjöl Nilsen). These breeding lines mainly start out with IC Nools Pink Patrik, EC Coccinels Turbo and also IC Coccinels Unicef. Special mention must go to GIC Anka av Böfjorden, a lilac point female with delicious type from Benill’s- and Fiori Avanti-lines. Her son EC (N)Fiori Avanti’s Orlando is a handsome lilac pointed male that has several BIS wins on his record. A lilac point female out of Turbo, EC Liberho’s Rhachade Astasi In Lilac, is the mother of several very successful Siamese from the (N)Astasiam prefix. The seal point female S*Putikat Vox Angelica, the result of a half-sister/half-brother-mating between two of Maytime Grandee’s offspring, has mated to Australian import IC Qwashon Blue Shadowfax produced a lilac point female, S*Arrax Lilac Aurora, who is the foundation queen of Mrs Else-Marie Zolnir’s breeding under the prefix S*Jamboree’s. Aurora’s son GIC S*Jamboree’s Lilac Alexander (SIA c) has been a successful stud during the first half of the 1990’s. A half-sister to Aurora, IC S*Arrax Crystal Galaxy sired by CH & GIP S*Arrax Mauve Mikado (whose pedigree includes Maytime Grandee and Daggryningens Blenda) is the foundation queen of S*Yahtzee’s cattery and has produced some lilac offspring including EC S*Yahtzee’s Jungle Brother, with several BIS wins and first swedish-owned lilac point to become European-titled in 1993. In 1989 a lilac point female, Yiman Magnolia (Gr Ch Roysterer Lord Catmando x Ch Bursi Coppelia) was imported from England. Magnolia’s daughter GIC Harlekins Hanna (SIA b) was mated to GIC (N)Hesno-Briom’s Pandore (SIA b) and the resulting litter included a very typy lilac male, GIC Taifun Tamino, who had a very successful show career a couple of years ago. Tamino’s litter brother, GIC Taifun Tom Puss (SIA b) was mated to Jungle Brother’s younger sister CH S*Yahtzee’s Flightcrash and the combination produced the very typy lilac point male CH & PR S*Chandini’s Toulouse. In the swedish Independent cat fancy Mrs Gun-Britt Palmqvist (Björkhagens cattery) imported a lilac point female, Zenobia Thila Ting, from England in the 1980’s. Other Independent prefixes that have shown lilac points in recent years are Zamirs, Fangas and af Porla. A lilac point that has had tremendous impact on the overall Siamese breeding in Scandinavia is the above-mentioned Gr Ch Daunus Pascali, through his to Sweden imported and very frequently used sons EC Pannaduloa Crackerjack and Ch of Eur Pannaduloa Bizet (both cream points), and also his grandson EC Sunsational Amadeus (red point) in Norway. Many of the type wise very good lilac point Siamese that have been bred in Sweden the past few years have had a too blueish point colour and too dark body colour. Other lines have very good lilac colour but lacks type instead. The colour on lilac points tend to improve when lilac-to-lilac-matings are done. The breeding stock is too small though and crosses with the best cats of other point colours are therefore necessary. The goal must be to combine colour and type to produce lilac points with the true pale dove-grey, slightly pinkish point colour and type just as good as the very best Siamese. A challenge to all admirers of this truly beautiful Siamese variety! Sources: Mary Dunnill: The Siamese Cat Owners Encyclopedia, 1974. Phyllis Lauder: The first lilac point Siamese, article in an older issue of Orientexpressen, translated by Elizabeth Aller.